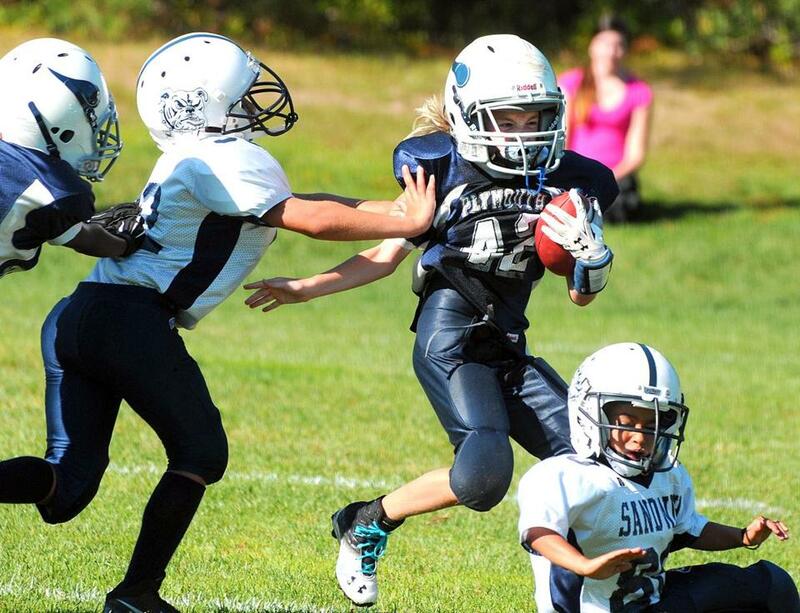 PLYMOUTH — Haylee Joudrey is 9 years old, with blue eyes, long blond hair that cascades out from the back of her football helmet, and a printout of her team’s 28 offensive plays neatly tucked into a plastic sleeve all but embedded on her left forearm. She’s the quarterback. It was a preseason physical exam in 2014 that found that Joudrey, then 8, had juvenile scoliosis, or curvature of the spine, which doctors at Boston Children’s Hospital ultimately discerned was caused by the Chiari condition. She underwent her first surgery in July 2014, began to play Pop Warner tackle football some six weeks later, only in October to require a second emergency operation on the Chiari when a follow-up MRI revealed spinal fluid was trapped inside her brain. The pressure exerted by her brain not fitting fully into the skull, explained Proctor, led to her scoliosis. The two surgeries fixed the Chiari and alleviated the pressure, remedying the flow of spinal fluid, but the scoliosis remains. Jourdey plays basketball in the winter time. Dr. John Emans, an orthopedic surgeon at Children’s, continues to monitor Haylee’s scoliosis. She has yet to require surgery for the condition, and possibly won’t need it, he said, depending on whether the curvature becomes more acute while she progresses to the end of her growth cycle. Frankly, sitting still has never been a page, or as much as a sentence, in Haylee Joudrey’s playbook. The middle of three children, between brothers Ryan (11) and Sean (8), she is all football, more football, and a lot of everything else there is to play. If not under center in the fall, she is a point guard during basketball season, a catcher during baseball season, always on boys’ teams. 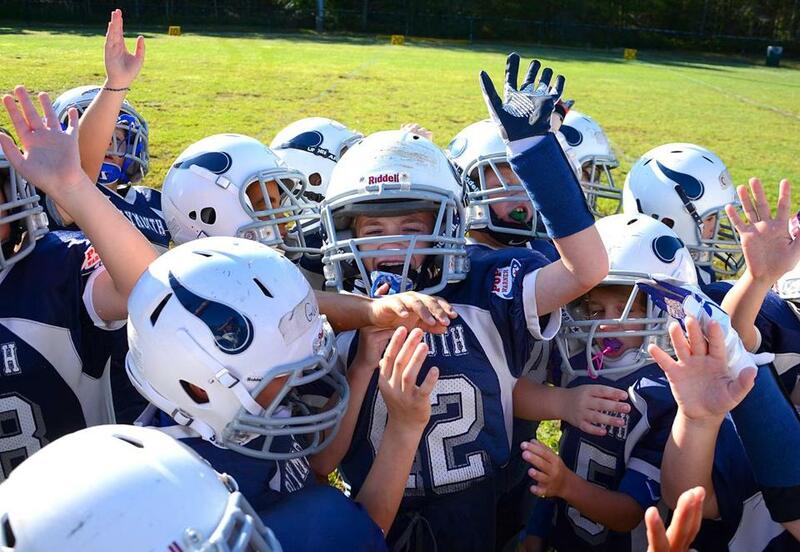 According to national headquarters in Langhorne, Pa., approximately 225,000 children, ages 5-15, are registered to play Pop Warner football this year. Josh Pruce, the league’s national director of communications, said approximately 1 percent, or some 2,250, are girls. Typically, added Pruce, girls choose to play quarterback or linebacker. In 2003, a girl approximately Haylee’s age today quarterbacked her team in Illinois to the Pop Warner national title game for her age group. Jasmine Plummer, of the Harvey Colts, ultimately became the subject of a full-length feature film, “The Longshots,” detailing the story of her sensational season at quarterback. Jourdey measures taller than most of her teammates. Though only 4 feet 6 inches, Joudrey is a notch taller than any of her Mitey-Mite teammates. Dressed in full gear, she shows no sign of her scoliosis or trace of her two Chiari operations. She not only quarterbacks, but in her game last Sunday, in which she directed the Vikings to a 19-6 win at Taunton, she took a few reps at running back and alternated between defensive end and linebacker when Taunton had the ball. Over the course of four quarters, she shook off a hand injury, a hip injury, and recovered quickly after a stiff tackle by one of the Taunton players knocked the wind out of her. She missed only a few downs all morning and showed near disdain for an icebag she was offered for one of her injuries. She is confident, feisty, fit, knows the plays cold, and isn’t timid about being in charge. Sunday during the game, in which coaches were on the field for hands-on tutoring, she more than once signaled to have out-of-position teammates hauled over to correct spots before she called for the snap. Maryellen Weeks, the president of Plymouth Pop Warner, said she has been inspired by Joudrey’s perseverance. She feels the two share a kinship, two females navigating what is a traditionally all-male sport, and she has particularly admired Haylee’s unyielding desire to keep playing despite health issues. 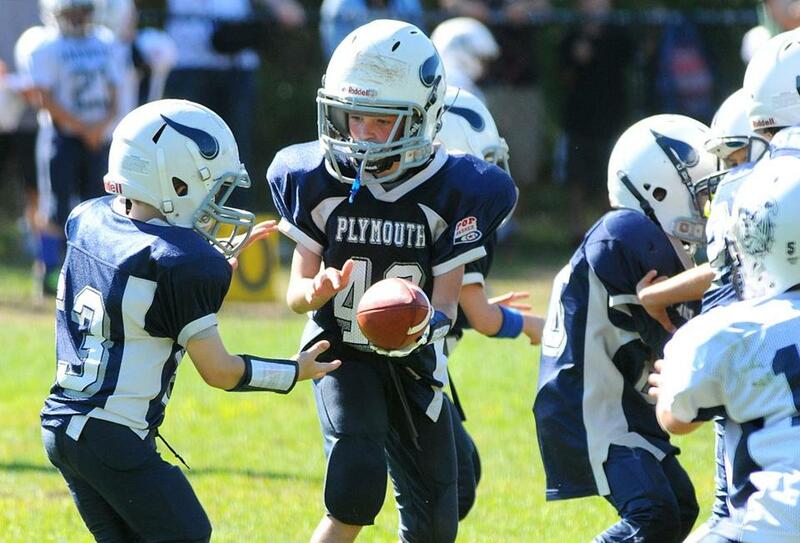 According to Weeks, a few of the biggest boys in Plymouth Pop Warner, who play in the league’s “unlimited’’ division, weigh more than 200 pounds, including one who weighs 231. Joudrey, now a fourth-grader, if she were to stick with Pop Warner into her early teens, ultimately could be facing a decided weight disadvantage. In many cases, girls who maintain a desire to play football end up as kicking specialists, in various roles of punting, kickoff, or field goals, limiting the instances in which they might face contact. Not surprisingly, Joudrey won’t entertain such a suggestion. Of the 28 plays she has listed on her forearm sleeve, only two are passes, a bootleg to the left and another to the right, one of those often meant for her brother Sean, her favorite receiver. Four others are designed for her to run the ball, and she was repeatedly in running mode last Sunday in Taunton. Her favorite quarterback is Tennessee Titans rookie Marcus Mariota. Jourdey’s favorite receiver on her team is her brother, Sean. Prior to her surgeries, said Joudrey, she only asked Dr. Emans if she would be able to play once she recovered from the operations. Assured that would be the case, she began focusing on the next set of downs. Noting that his daughter is a “tough chick,’’ Paul Joudrey said he hopes Haylee’s story encourages other children, especially those with scoliosis, to get out and play.